Bruno Gollnisch was born in 1950. He is married and he has three children. His family is from the East of France that is to say from a region that is attached to the nation’s freedom and independence. His great-great-grandfather, Edmond Gollnisch, mayor of Sedan in 1870, heroically faced the Germans’ requirements when Emperor Napoleon III and the French army lost the battle. The family house was occupied three times in a century and finally burnt by the Germans. One of his great-grandfathers, Emile Flourens was Foreign Secretary and made Bismark retreat in 1886. He was the initiator of the alliance between France and Russia in 1896. Emile Flourens’ brother, Gustave, died as a military leader of the « Commune ». His uncle, Paul Viard, former dean of the Law faculty and deputy of Algier, told him about the tragic history of millions of our Christian, Muslim and Jewish French compatriots who lived in Algeria and whose throats were cut by FLN terrorits. Bruno Gollnisch found it revolting. He was very young when he heard about a courageous deputy who decided to commit himself rather than stay at the National Assembly. This deputy was Jean-Marie Le Pen. 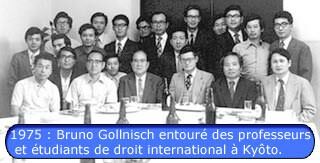 After studies in Paris where he won a prize at the General Competitive Examination of the French-speaking youth, Bruno Gollnisch began to study Law, Politics and Oriental Languages in the university. At first he wanted to become a diplomat. He was 17 when he entered the Nanterre university and witnessed left-wing young middle class people wrecking the new universities built thanks to the sacrifice of all the French, including the more modests ones. Marxism and the revolutionary ideas disgusted him. He became aware of the fragility of our modern societies, of the recruitmet of the youth by the left-wing, and of the decline of the French intelligence. All this urged him to get involved in civic life. 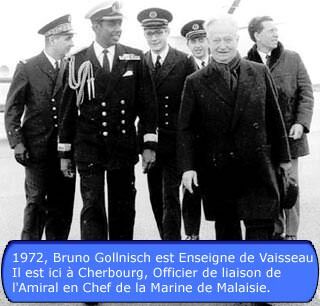 At the time he studied in the faculty of Nanterre, Bruno Gollnisch met Marie-France and Jean-Pierre Stribois. Thanks to them he met a very courageous man who fight to defend the free world against communism : Roger Holeindre. One day he went to a public meeting with them. Jean-Marie Le Pen made a speech. At that moment he chose his political party. In 1971 he interrupted his studies and terminated his deferment to enlist in the Navy. He had a diploma of Superior Military Preparation. When he enrolled he was already midshipman. Six months later he became the youngest officer of his promotion. He served successively in the School of Transmissions, on the Trial ship of Missiles Henri Poincaré, in particular at the time of the Summit Meeting between the American President Nixon and the French President Pompidou in the Azores, then in the 2nd Office of the General Staff (Operations-Intelligence), on the Mine Hunter « Calliope » and he participated in its first cruise. Finally he was aide-de-camp of the Vice Admiral responsible for the tests of the Fleet. Bruno Gollnisch still is faithful to his commitments and nowadays he is Spare Commander. In 1974, financed by the Ministry of Foreign Affairs he became research attaché in the Law and Politics Faculty of the prestigious University of Tokyo, Japan. When he came back from Japan he began a university and liberal career. 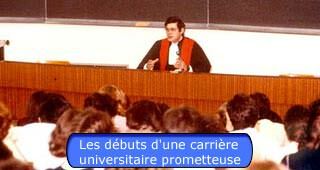 Doctor of Laws, prizewinner of the Paris University, he became Legal coucil and lawyer. He is graduated of Oriental languages (Japanese, Malay and Indonesian) and he is one of the French specialists of Far East laws. He created the course of Far East countries law in the Law Faculty of Paris and that of Japanese Law in the « Institut des Langues Orientales ». Then he was appointed « Maître de conférence » of Public Law in the University of Metz, and Professor of Japanese language and civilization in the University of Lyon where he became the youngest dean of France shortly after. His stay in the Navy and in Japan then his university career took him away from Paris but friendships are never forgotten. In January 1984 the press noticed the dean Bruno Gollnisch who welcomed Jean-Marie Le Pen during a triumphal meeting of the Front National in Lyon. Shortly after, Jean-Pierre Stirbois, the General Secretary of the Front National, appointed Bruno Gollnisch as Departmental Secretary of the Rhône. In the difficult context of that time (hostile demonstrations, total lack of means) he organized the 1984 European elections, the 1985 divisional elections and the 1986 Parliamentary and regional elections. He was elected deputy and regional councillor. Bruno Gollnisch participated in the writting of the program the Front National adopted in 1984 and that was called « Pour la France » (« For France »). During the 1986 Congress he was elected to the Central Committee (that defines the movement’s propaganda operations and tactical choices) and to the Political Office where he sits since then. In 1994 Bruno Gollnisch became Vice President of the Front National and created the international affairs delegation that is the « Ministry of Foreign Affairs » of the movement. In October 1996 Carl Lang, the General Secretary expressed his wish to be relieved of this arduous responsibility to devote his time to the Region Nord. 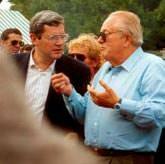 Jean-Marie Le Pen put forward Bruno Gollnisch to become General Secretary at the nomination of the Political Office. Faithful to the promises made to the militants and to the electors of the Front National during the past crisis of Jean-Marie Le Pen’s party, Bruno Gollnisch summoned up around him the energies necessary to the Front National regain and rebirth. 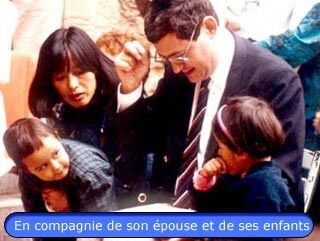 So on November 1999 he was given the direction of the FN General Delegation. Nevertheless Bruno Gollnisch is a fieldworker very attached to his region (where he still is Regional Councillor) and to Lyon where he has been councilman. 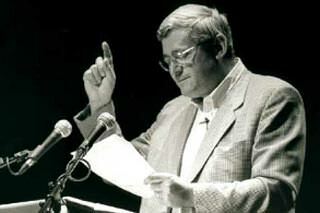 Jean-Marie Le Pen decided that the Great Convention Le Pen 2002 would take place in Lyon during two days. Its success was total and several thousands of people came. At the same time, at the 1986 regional election, the Front National obtained a group of 14 regional councillors. Bruno Gollnisch is elected President of the Front National group in Charbonnières. With his group he fights against the fantastic taxation increase. The electors have taken this work and determination into account : during the 1992 elections the Front National passed from 14 to 29 councillors whereas all the other groups regressed, and during the 1998 elections from 29 to 35. In March 1986, 35 deputies of the Front National were elected to the National Assembly. Bruno Gollnisch represented the Rhône at the Palais Bourbon. He was elected Secretary at the National Assembly and he denounced the parliamentary absenteesim. He also defended in session Jean-Claude Martinez’s proposal to suppress the deputies’ fiscal privileges. He became Spokesman for the civil aviation budget. Chirac and Pasqua changed the voting system to eliminate the Front National from the National Assembly. Bruno Gollnisch lost the 1988 elections because of the effect of this division and the change in the voting system but thanks to Jean-Marie Le Pen’s confidence and to the French voters’ will he was elected to the European Parliament in June 1989. 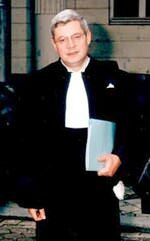 He was reelected to the European Parliament in 1994 and in March 1999. His training of international jurist and linguist predisposes him to this function. 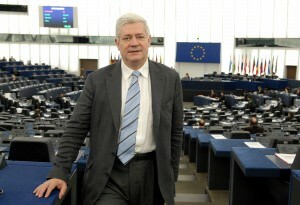 He has been defending the French agriculture against the international trusts, the European industry against the unfair competition, the requirements of moral against permissiveness, and the people’s rights against globalization for 8 years, constantly travelling from Paris to Bruxelles, Strasbourg and Lyon, with the right-wing group chaired by Jean-Marie Le Pen. He is Jean-Marie Le Pen’s attorney within the Regulation Committee and before the Assembly each time its tries to lift Jean-Marie Le Pen’s parliamentary immunity to prevent him from speaking. 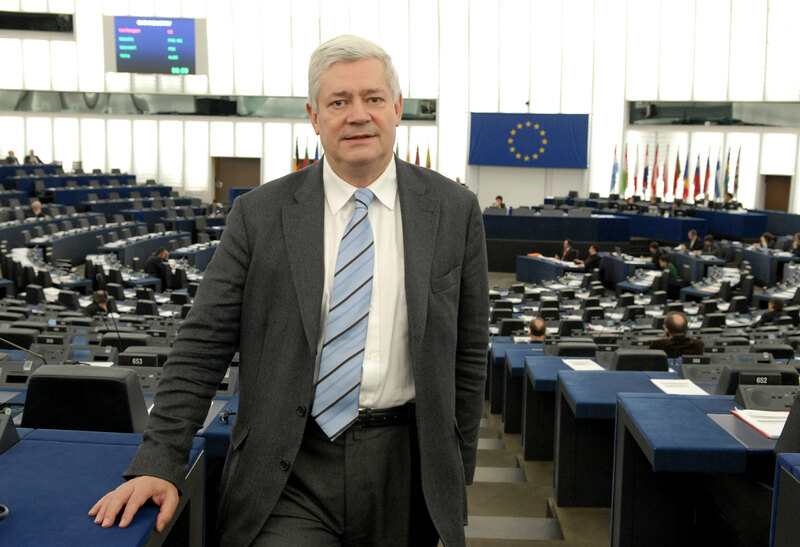 In its selection of the most out-standing personalities of the European Parliament, le Figaro describes him as a « formidable jurist and speaker ».